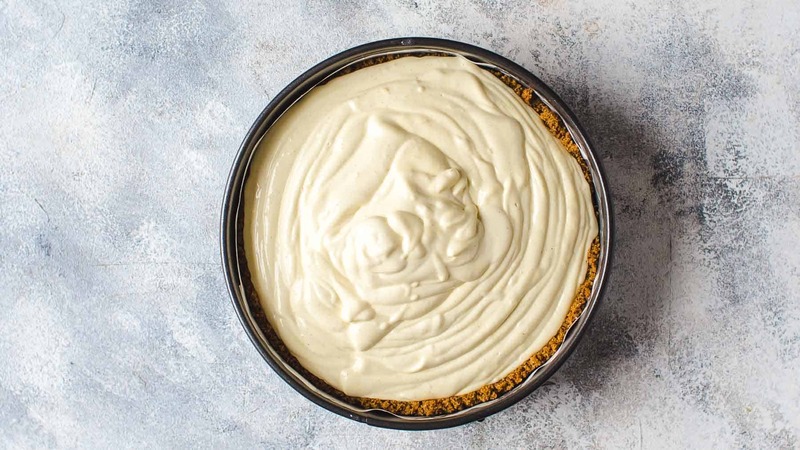 This super creamy Lemon Cheesecake recipe is easy to make and comes with detailed step-by-step instructions and photos + video. You need just 10 ingredients and 15 minutes of hands-on preparation time. You don’t know how to decorate your Lemon Cheesecake? No problem. I got you covered. I added additional recipes for three different toppings. Plus mini tutorial on how to line a springform pan. 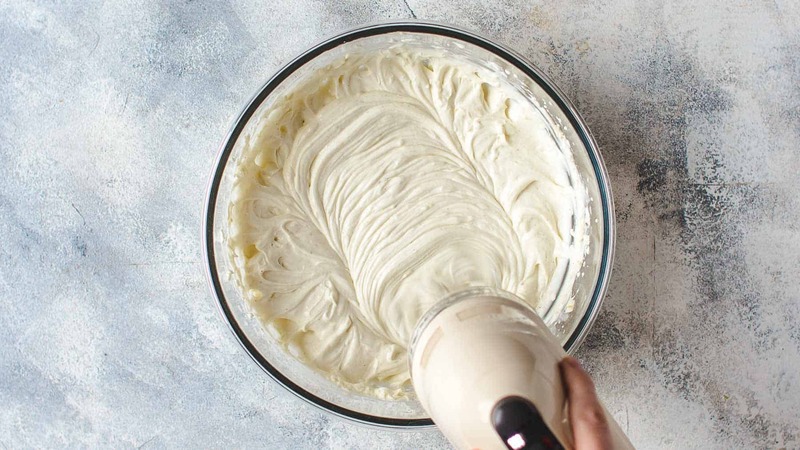 If you cover the bottom and the sides of the cheesecake entirely, you don’t need to worry about how to remove cheesecake from the springform pan. 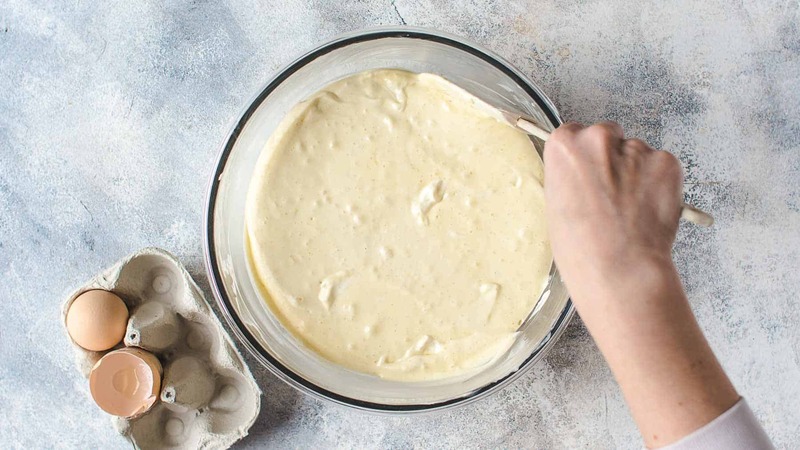 After baking and chilling, just open the pan and remove the paper from the cheesecake. I show you how to line a springform pan properly. 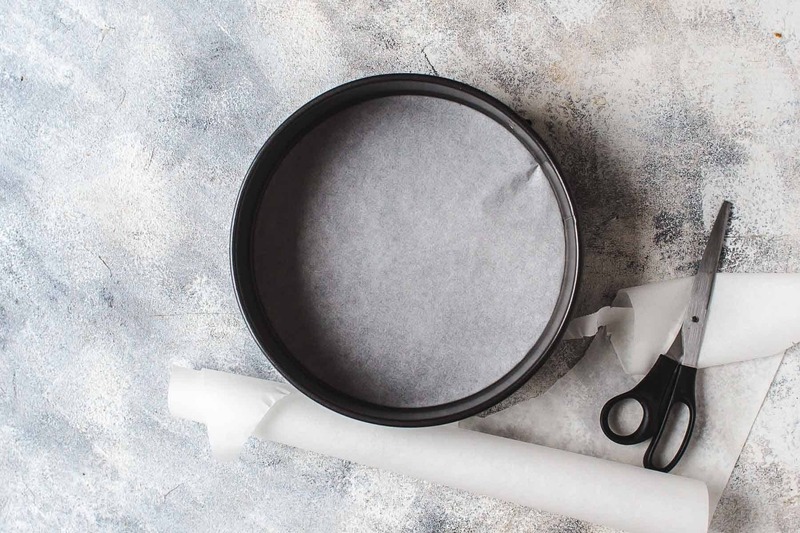 Take the bottom of a springform pan and line it with parchment paper. To use just one paper (if already cut) for the bottom and the sides, make sure that the bottom is in a corner of the paper. Then place the ring of the springform pan on top of the bottom and close it slowly. Adjust the paper while closing the ring that it doesn’t wrap in the center. Then cut the paper around the edges of the pan. Use the same paper and cut two 3 inches broad and 15 inches long stripes along the long side of the paper. Take one of the stripes and line the sides of the pan. Spray a bit of non-stick spray underneath the paper that it sticks to the pan. Alternatively, you can use oil and a brush. Repeat with the second stripe that all sides are completely covered. In the 92 seconds recipe video, you see the whole process of lining a springform pan with parchment paper. So after we have a properly lined springform pan, we can start making the Lemon Cheesecake. But before you start making the cheesecake, make sure that all ingredients are room temperature. It makes it easier to mix the ingredients, and you don’t run the risk of overmixing the filling to get it smooth. 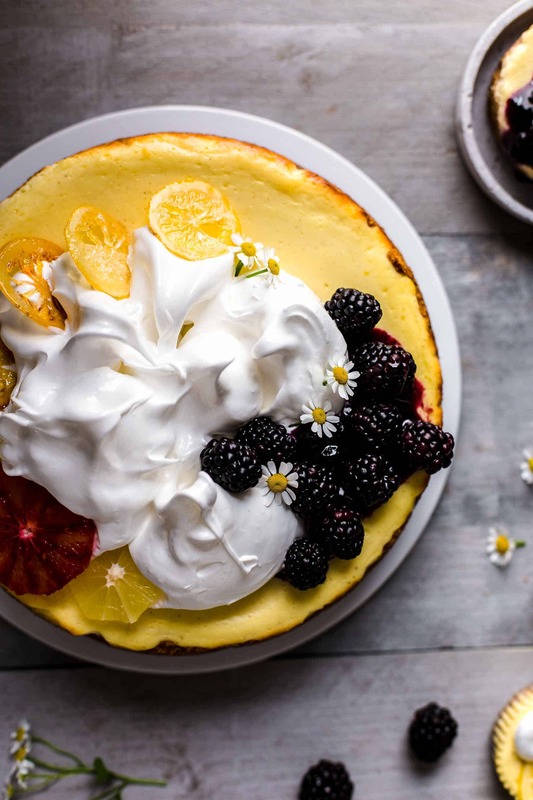 Overmixing is a common reason for cracking cheesecake. Start with the crust. 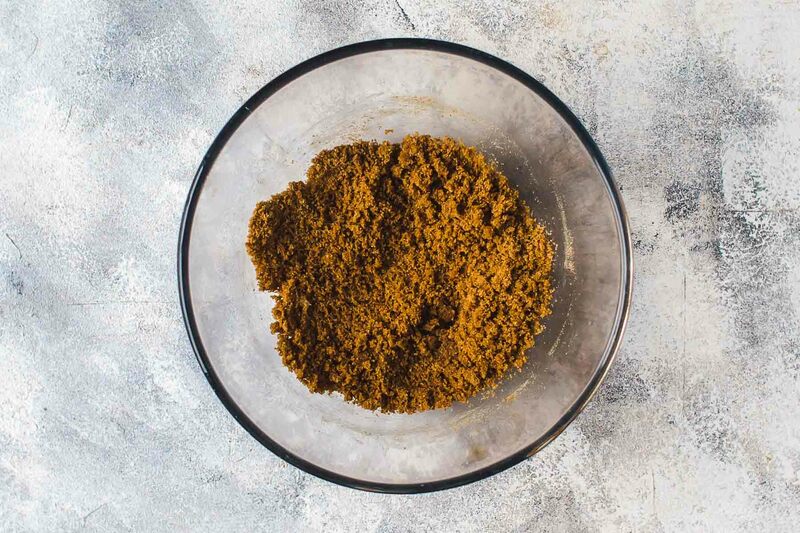 To get graham cracker crumbs, place them in a food processor and pulse until finely ground. Alternatively, place them in a zip-top bag and smash them with a rolling pin into fine crumbs. Combine graham cracker crumbs, sugar, and butter in a bowl and stir until evenly moistened. 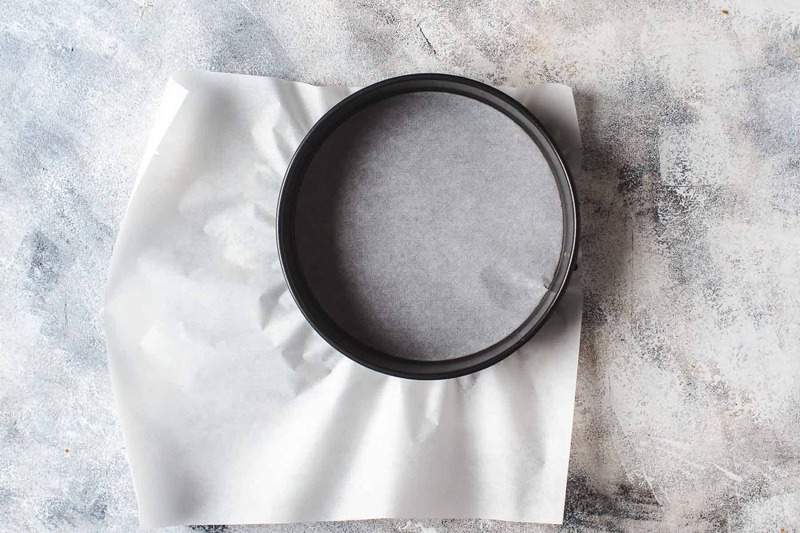 Transfer crumbs to the prepared springform pan and press with a flat bottomed cup into the bottom and halfway up the sides. Bake for 10 minutes. Set aside. For the filling, you need cream cheese, sugar, flour, sour cream, lemon juice, lemon zest, vanilla, and eggs. Lemon and sour cream add sourness to the cheesecake. Please use freshly squeezed lemon juice and not concentrated one. 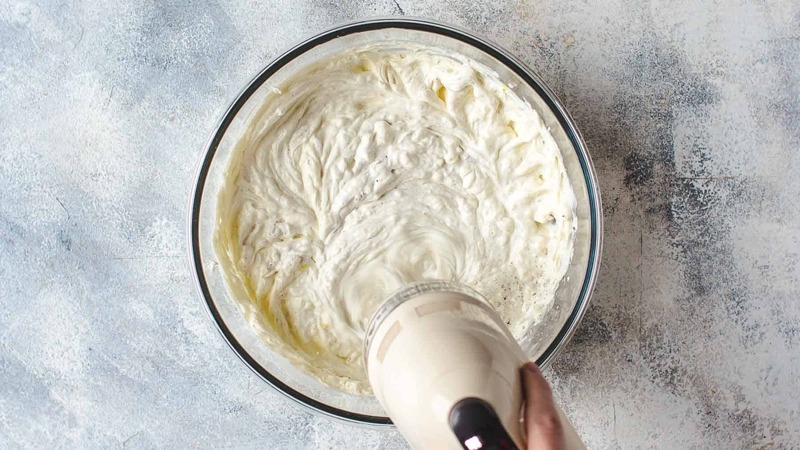 Mix cream cheese, sugar, and flour to combine. Then add sour cream, lemon juice, lemon zest, and vanilla and whisk to combine. In the beginning, when mixing in the lemon juice, it will look like it curdles, but after a few seconds, it gets creamy and combines. Add one egg at the time and stir to incorporate. Before you add the last egg, scrape down the bowl. Pour filling into the crust and spread evenly. The consistency of the filling is creamy but towards liquid. Do not overmix at any step. Otherwise, your cheesecake could crack. Bake for 45-55 minutes. Because we all know the problem with leaking springform pans, place parchment paper between the pan and the wire baking rack. You don’t need to additionally wrap foil around the pan because it does not leak that much. After baking, turn off the oven, crack open the door and pinch a wooden spoon. Let the cheesecake another hour in the oven. Then remove from the oven, place on the counter and let come to room temperature. Place in an airtight container and chill in the fridge for at least 4 hours but preferably overnight. You can substitute the sour cream for Greek yogurt. I don’t recommend to substitute for heavy cream because it results in a milder taste. 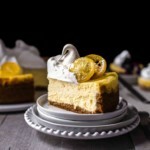 How to convert Lemon Cheesecake into Mini Lemon Cheesecakes? 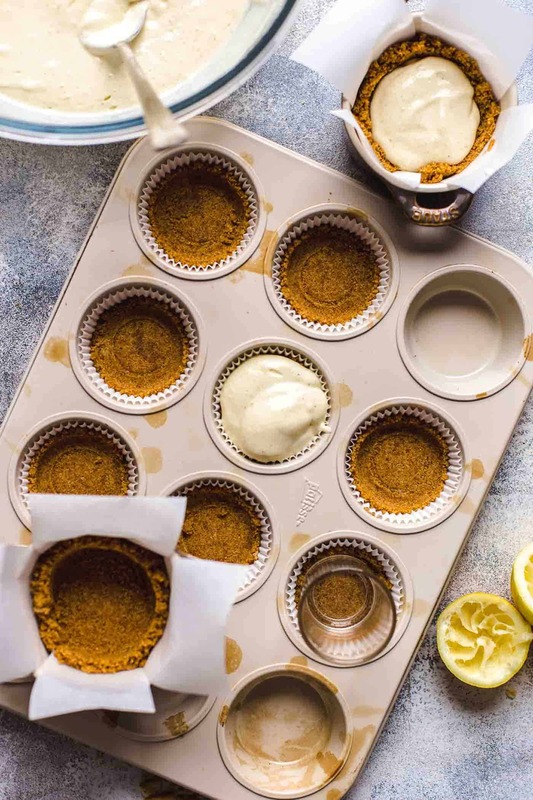 If you want to make the whole recipe, you will end up with 24 Mini Lemon Cheesecake Muffins or 12 ramekin-sized Mini Cheesecakes. You could divide the recipe in half for 12 cheesecake muffins or 6 ramekin-sized mini cheesecakes. Here is a blog post about how to make mini cheesecakes with detailed instructions and video. 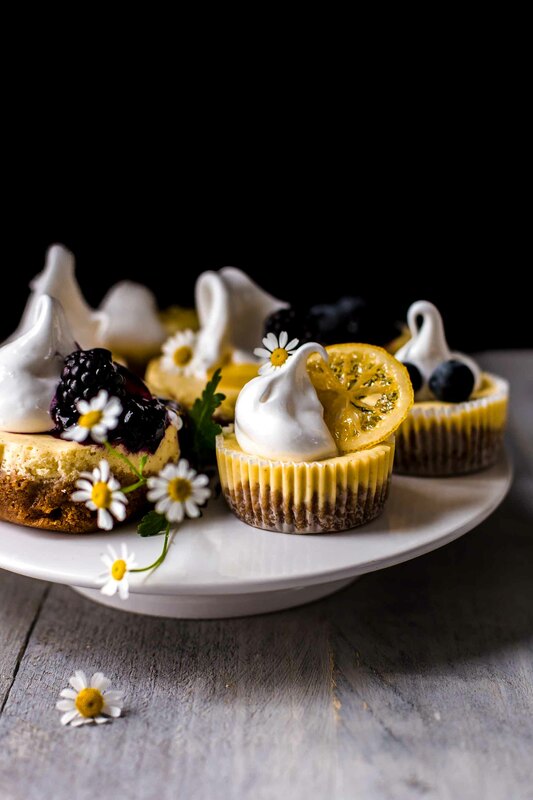 Although it’s another recipe, you can follow the instructions and read additional information about making mini cheesecakes. How to tell when a cheesecake is done? 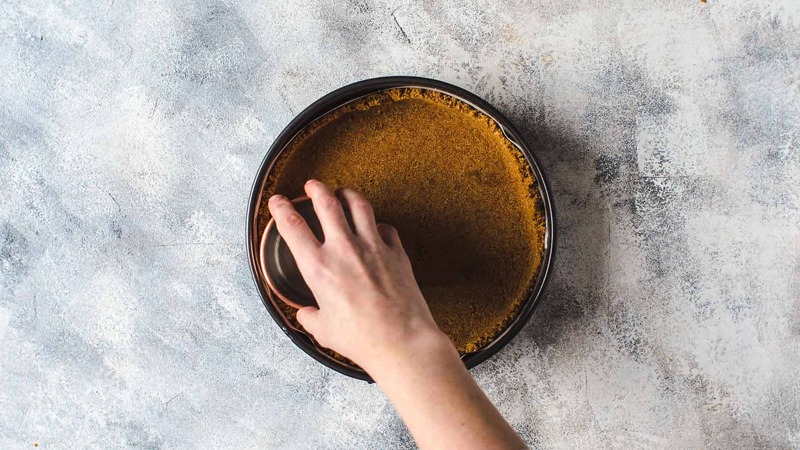 To tell when your cheesecake is done, gently shake the pan. The edges should be very lightly browned and set with a slight jiggle in the center. The wobbly center should be about 3-4 inches in diameter and very bright and shiny. In the picture below, you see that the center is shinier as the edges. This 3-4 inches spot should still be wobbly when turning off the oven. 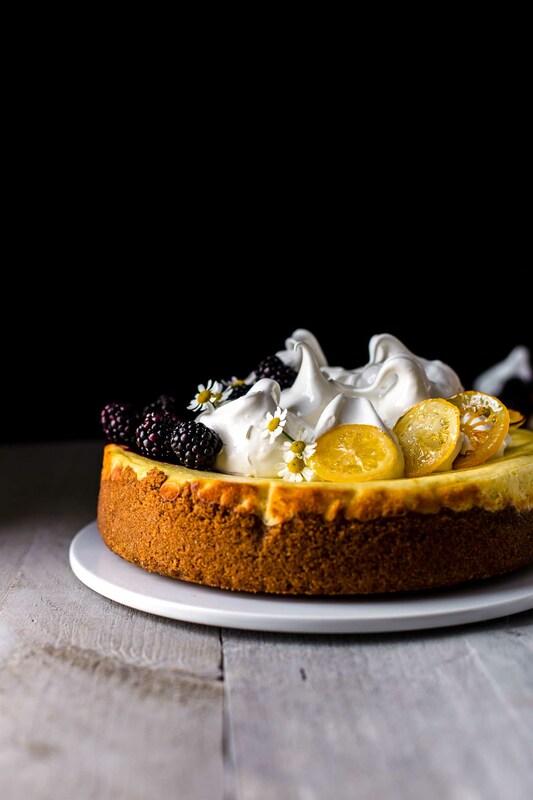 How to decorate Lemon Cheesecake? You have different options here. I decided on a mix of meringue, candied lemons, blueberry compote, and fresh fruits. If you love marshmallow meringue, you should opt in for this topping. 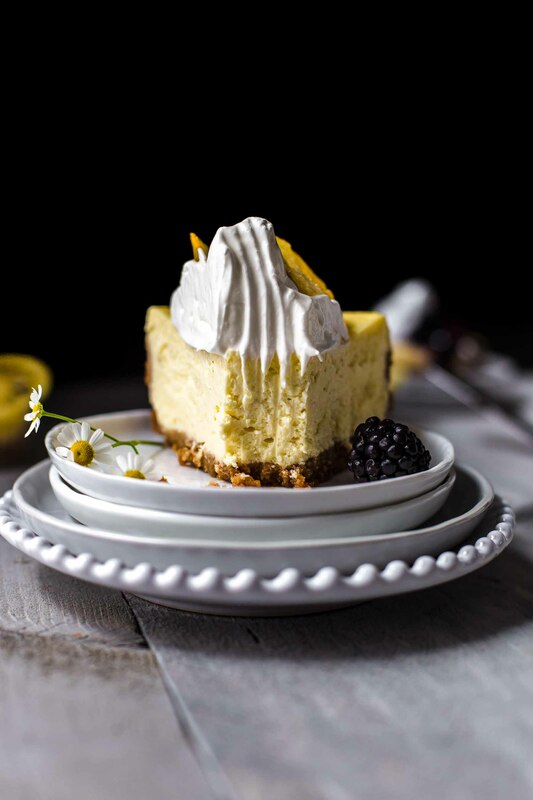 Lemon cheesecake with Meringue is just dreamy. Fill a saucepan 2 inches high with water and bring to a simmer over medium-low heat. 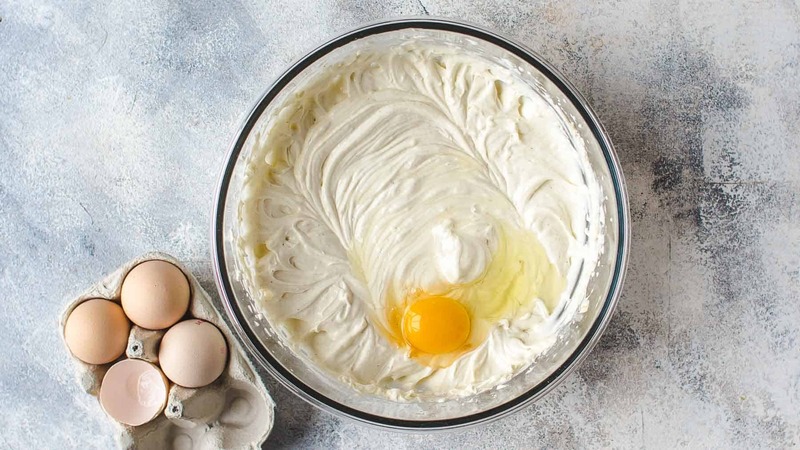 Place egg whites, sugar, and cream of tartar in a heatproof bowl (preferably glass) and set over the saucepan. The bowl should not touch the water. 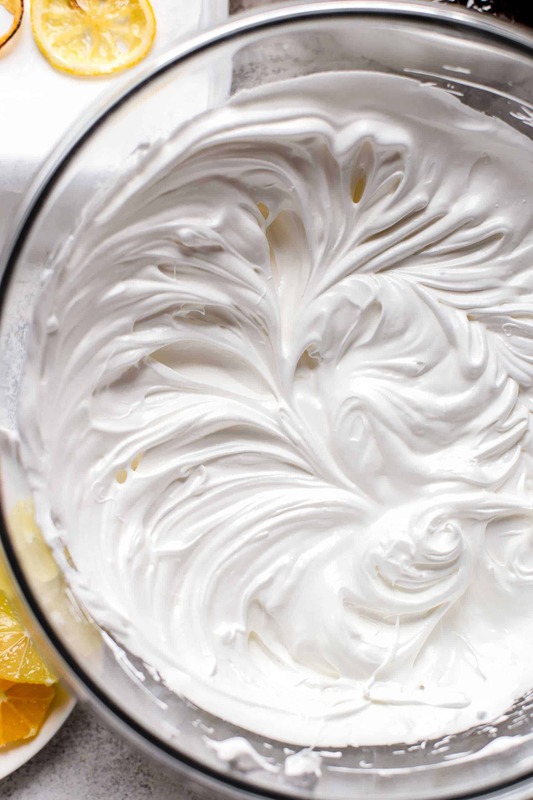 The meringue should be warm to touch. 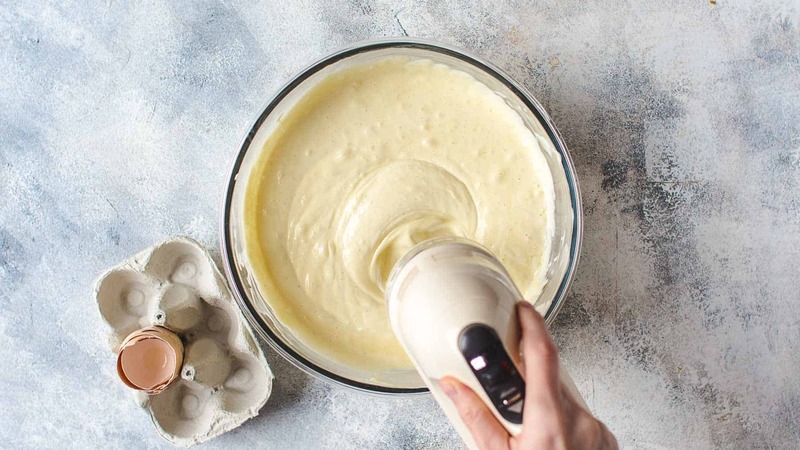 Remove from heat and beat with an electric mixer fitted with a whisk attachment on high speed until shiny, glossy, and stiff peaks form, for about 5-7 minutes. 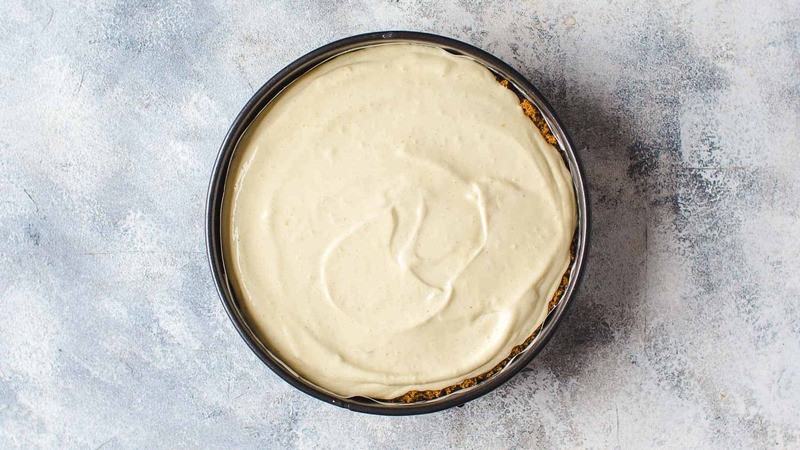 Fill in a piping bag or spoon on top of chilled cheesecake. The meringue may start to weep a little bit after 2 days. Because the egg whites are warmed, you don’t need to be worried about salmonella. Candied lemons are a great topping for Lemon Cheesecake. They are sweet, sour, chewy and sticky. Because you eat the candied lemons with the peel, you may want to use lemons with an untreated peel. Buy organic lemons if possible. 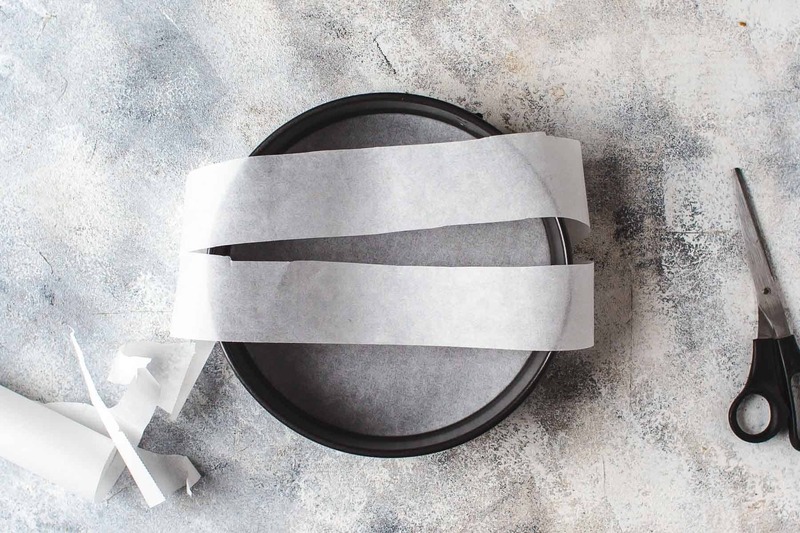 Line a cookie sheet with parchment paper and brush lightly with oil. Set aside. Wash the lemons carefully and dry them with a paper towel. Set aside. In a large skillet, combine all ingredients and bring to a simmer over medium heat. Cook until lemons are translucent, about 5-10 minutes. Stir regularly. Transfer lemons to the prepared sheet and let dry. Do not overlap the lemons. The oil on the paper makes sure that the lemons don’t stick to the paper when they dry. 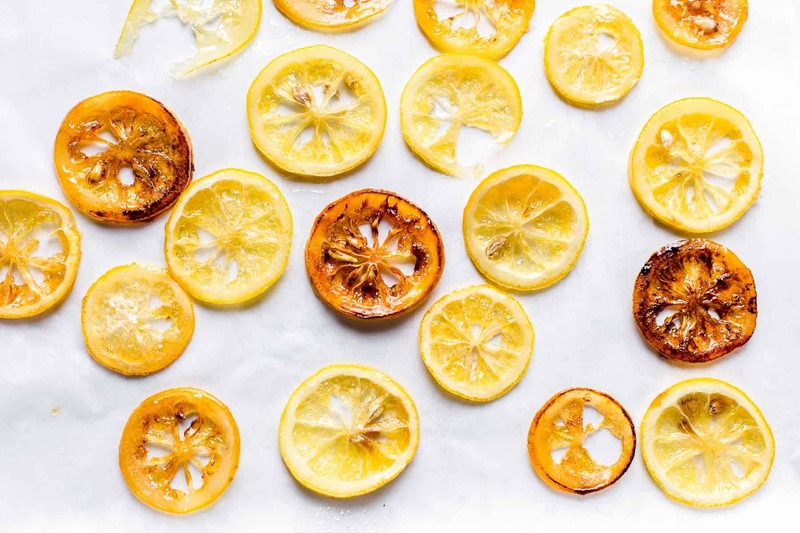 If you want to brown a few of your lemon slices, remove all the sugar liquid from the pan and place a few lemon slices back to the pan. Let them caramelize for about 1 minute or until brown. Cover and store them at room temperature. Place on top of your chilled cheesecake just before serving. Okay, lemon + blueberry = dream team. Am I right? In a medium saucepan, combine all ingredients and bring to a simmer over medium heat. 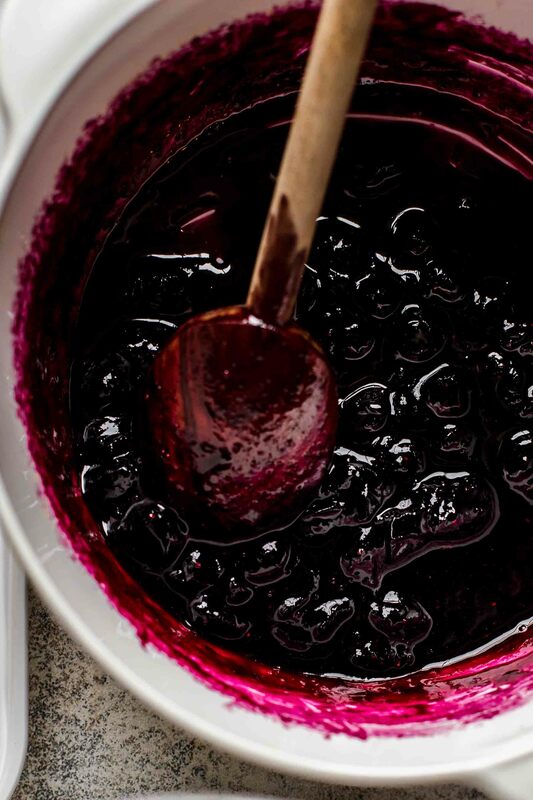 Cook until the blueberries are soft and the sauce has thickened up and is reduced by 1/3, about 5-10 minutes. Let cool down to room temperature. Spoon on top of chilled cheesecake before serving. How to freeze Lemon Cheesecake? 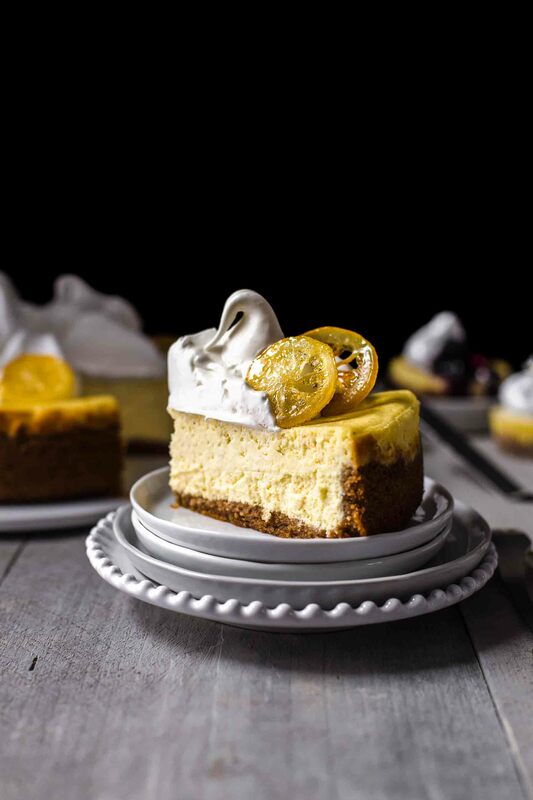 If you make this Lemon Cheesecake recipe leave a comment, rate it and tag a photo #alsothecrumbsplease on Instagram! Would love to see your snap! 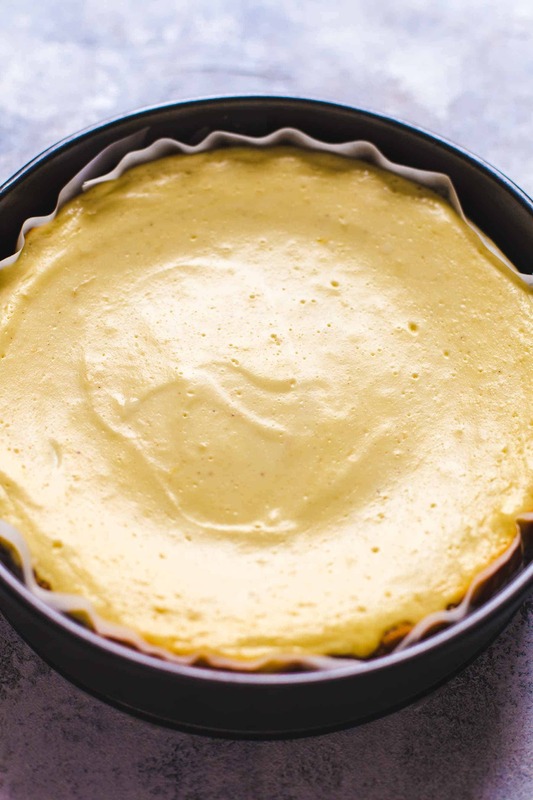 This super creamy Lemon Cheesecake recipe is easy to make and comes with detailed step-by-step instructions and photos + video. You need just 10 ingredients and 15 minutes of hands-on preparation time. Preheat oven to 350°F / 175°C. 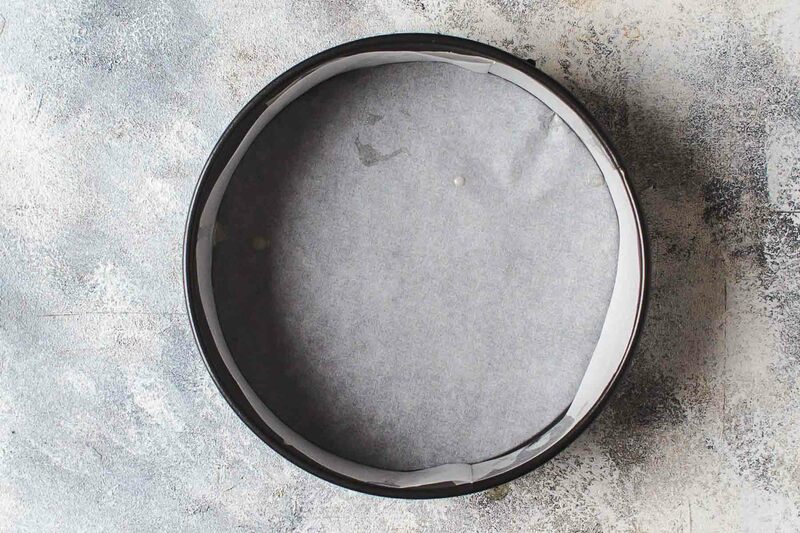 Line the bottom and the sides of a 9" (23cm) springform pan with parchment paper. Watch the photo-tutorial in the blog post above on how to line a springform pan properly. Set aside. Graham cracker crust: In a large bowl combine all ingredients and stir until evenly moistened. 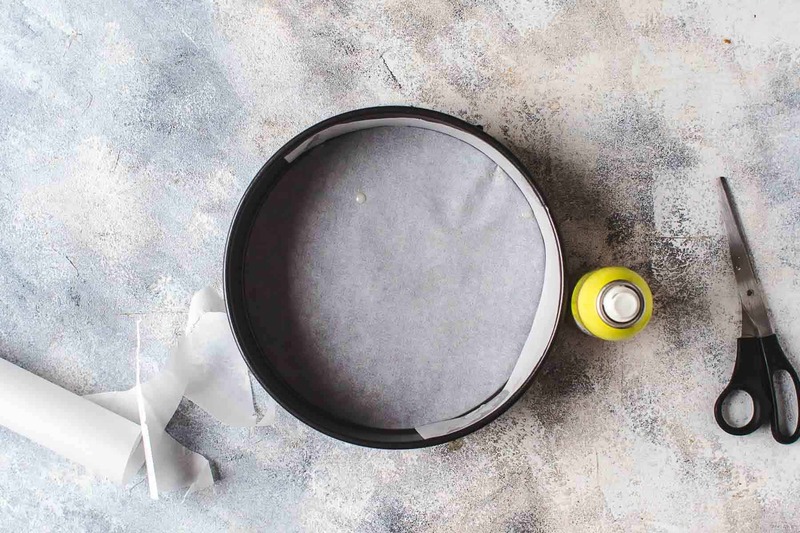 Transfer to the prepared pan and press crust with the back of a flat-bottomed cup into the bottom and halfway up the sides. Bake for 10 minutes. Remove from oven and allow to cool until you are done with the filling. 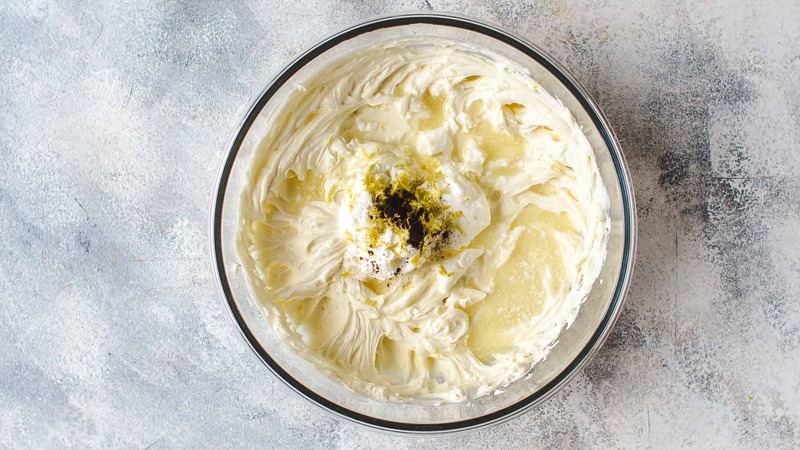 Lemon cheesecake filling: In a large mixing bowl, using a handheld or stand mixer fitted with a whisk attachment, whisk the cream cheese, sugar, and flour just until combined no lumps remain. Add sour cream, lemon juice, lemon zest, and vanilla* and stir to combine. Add one egg at the time and mix just until combined before you add the next egg. Scrape down the bowl before you add the last egg. Mix to combine. Don't overmix at any step. Too much air in the filling can cause cracks while baking. Pour filling into the prebaked crust and spread evenly. Place a piece of parchment paper under the springform pan and bake for 45-55 minutes until the edges are set. The center should be very bright and almost set with a 3-4 inches wobbly spot in the center. Don't overbake until the cheesecake is browned because this is a common reason for cracked cheesecake. The cheesecake will firm up as it cools. I baked mine for exactly 45 minutes. Watch photo above (how to tell when a cheesecake is done) to see how the baked cheesecake should look like. Turn off the oven, crack open the door (pinch a wooden spoon), and let the cheesecake in the oven for another hour. Then remove from the oven and let cool to room temperature. Refrigerate at least 4 hours or overnight. Decorate before serving, if desired. You find additional recipes for toppings in the blog post. Store leftovers in an airtight container in the fridge up to 3 days. Watch the 92 seconds video to see the whole process. Find additional recipes for meringue, blueberry topping, and candied lemons in the blog post. These are all great toppings. Read the blog post for additional information on how to freeze Lemon Cheesecake, substitutions, how to convert into Mini Cheesecakes, etc.